This post is the first in a new series profiling the outstanding work coming out of our universities and colleges. A couple of months back I was invited to participate in an AGDA speed dating event. 20 people from industry answered burning questions from 40 students and recent graduates. It really struck me that there were a lot of common themes (and pain points) for students. As an industry we produce significantly more graduates than the volume of employment opportunities we offer. This creates fierce competition for design students and grads hungry for work in a saturated market place. More than ever attitude is as important as aptitude in design. It is the students that are the most dedicated, enthusiastic and tenacious that will succeed. A beautiful portfolio alone won’t necessarily get you hired. But students that combine great quality (execution) design outcomes (creativity), with rigorous design process (curiosity) and excitement for their craft (passion) are the people destined to make an impact on our industry. Today I profile one such student. Nathan Stevens - who I believe is destined for great things! I first had the pleasure of meeting Nathan in July at one of my Alphabet is Code workshops. Nathan had traveled long distance to attend and engaged with each and every drawing exercise with enthusiasm. After the course Nathan and I had the opportunity to chat about his work and study. I was so impressed I actually reached out to Whanganui School of Design afterwards to congratulate them on the calibre of their teaching and students. Fast forward a couple of months and the AGDA speed dating was still playing on my mind. I reached out to a number of my academic contacts and asked them to encourage their students to share their work, research and methodology. It was with great excitement I saw Nathans name pop up in my inbox to tell me about his latest project. (A thoroughly researched type design initiative to improve reading for people with Dylexia). We exchanged a number of emails over the last month and I am pleased to profile Nathan and his Work-In-Progress current project in part one of this series! WIP Typographic Design in response to Nathans Research into reading difficulties for Dyslexics. I am in the final throws of a degree in Graphic Design at the Whanganui School of Design where our degree projects are our key focus. Prior to this I have flirted with the industry and done stints as a screenprinter, done questionnaire layouts for a research company and spent some time as a designer for a trophy company doing laser engraving and vinyl printing. After being given an opportunity at The Design School out of Palmerston North I decided to go on to further study in Whanganui. Having learned by osmosis as a child from a Graphic Designer/Artist mother and a Structural Engineer/Architect father, my style is influenced by both the technical and creative sides of design. This is probably why I am attracted to typography and type design with its combination of rules and conventions and yet within them the scope for individuality is infinite. Of course my degree in psychology would suggest that it is probably more likely to be a subconscious desire to control and manipulate words and letters as a result of the reading difficulties I have battled with all my life, but I’m in the denial stage at this point. Tell us a little about the project? My experience and background in this subject is personal as a Dyslexia sufferer. As a sufferer I have struggled to read on a daily basis. As a type designer I was intrigued when I came across a typeface designed for dyslexia sufferers that said that it improved literacy called Open Dyslexia (below). My initial thought was that it was a weird looking typeface and I wanted to know why they had produced it this way and what they were basing these changes to traditional type design on. Type design has a certain number of guidelines that they tend to follow, based on centuries of designing and publishing type, that are supposed to make it easier on the eye for the reader. Many of these are subtle but in the case of this typeface the changes seemed to be exaggerated and some cases went totally against the norm. After exploring existing dyslexic fonts (and industry guidelines) to identify the design characteristics with the potential to improve literacy for dyslexics. I am now applying the findings to develop a typeface in three weights. Some of the visual research and process is shared below. In typography (and type design) we understand that both the black and the white shapes are critically important. In 'Analysing the Dyslexia Friendly Typeface' you noted that italic/oblique faces reduce legibility and effectiveness for Dyslexic readers. And also that open bowls seem to be one of the most vital characteristics for reducing reading errors… The nature of incised letterforms often does translate into constrained/condensed counter-shapes do you think its the white shapes that might make italic more challenging for a dyslexics eye? Or do you attribute it to the black shapes being a departure from the conventional archetypal letterforms that make these letters less familiar and harder to read? Or is it neither? Or a combination of both?! There is evidence that dyslexics prefer monospaced typefaces and those with larger bowls. This would seem to indicate that the white space is an important factor in both areas. Possibly the closed up nature of incised letterforms could be a hindrance to the dyslexic reader. It may also be that the letterforms leaning into each other and the joined up nature of the letters that makes it difficult for a dyslexic to identify the individual letterforms or wordshapes. As to whether the departure from the archetypal letterforms may be a factor, I am not entirely sure. Research I discovered about an effect called dysfluencey might be relevant here. They looked at the retention of information and found that people retained more information for longer if the typeface they were reading was a bit quirky and less sterile as some modern digital typefaces can be. The interesting fact here was that this effect was twice as strong for dyslexics. This may be partly why many dyslexics state Comic Sans as their preferred typeface and is another possible area that could be looked into. One of the areas of research that has propelled your current trajectory is the thinking behind road sign legibility. Can you tell us a little about what you learned from the large scale signage that you’re applying to your text face? what are the common characteristics? The characteristics that I have found, mostly from the studies done into Clearview Hwy, have actually echoed some of those reported by the research I initially looked into. The areas that I took from the Clearview research was the focus on the increasing of the size of the bowls and openings, and most importantly, their decision to create differentiation between letters to aide in word recognition. This tied in nicely with the top half legibility but made sure that the over all shape of the letter was considered and didn’t deviate too far from the traditional archetype, which I believe has been an issue in some previous attempts. Which tools are you using to design? The first step is always the pencil and paper, still the best way to get an idea started and refined. Once I feel I have created enough letters (sometimes all 52) to form a system or style-guide, I then jump on the computer. The first thing is to create the letters, in Illustrator, that contain parts that can be used in the creation of other letters. All going well, the next step is Fontographer. I am still learning the ins and outs of this program. I am sure there are some things I am doing the long way but I struggle through and am gaining more confidence with it as I go. I would like to have a go with Glyphs, as I have read good things and believe there is a shift in the industry towards it, but most of my work is done banging away at PC laptop at home. You mentioned you’re currently in the digitzation process developing your letterform sketches into a .ttf - have you started thinking about a name for your font? For the longest time it was codenamed Tesyone (Tess-e-own), a typing error for “test one,” which seemed appropriate given the purpose of the typeface. Eventually I had to get serious about the name and started researching any word that implied clarity or legibility. After hitting a number of dead ends I looked to foreign words that might be usable. The first language I tried was Latin and the first word I translated was “letters,” which led me to Litterae or Literae. A quick search yielded no existing typeface with those names and in a discussion with a friend he recommended that the double ‘t’ might be an issue for dyslexics. So Literae it is. 'If anything this research has proven that there is a need for more research and possibly new directions that need to be looked at.' Given your own experiences as a dyslexic reader, the insights you have gained from the existing research and your interest in type design characteristics - is this an area of research you intend to pursue after your current study is complete? is this the first and only typeface for dyslexic readers you will be designing? Or has this face whet you appetite for more research driven typographic outcomes?! I see this typeface and any future typefaces as an ongoing process. The research into the causes of the eighty odd reported symptoms associated with dyslexia is ongoing and complex. This means that I would be naive to think that I will find the panacea for all forms. So for the future I plan to continue to develop, refine and restart if necessary. How, where and when at this point is not exactly clear but I plan to continue. Even if only to make others think about these issues when they create their own typefaces. What is it about designing type and typography as a specialty that has piqued your interest? If I look back over my life I guess I’d have to say that I have always had an interest in type. I was lucky to be surrounded by both formal and informal examples of type thanks to my parents. I see it something that has a set of rules and a defined structure, which I like. Yet within that set of rules and structures there is an infinite number possibilities. 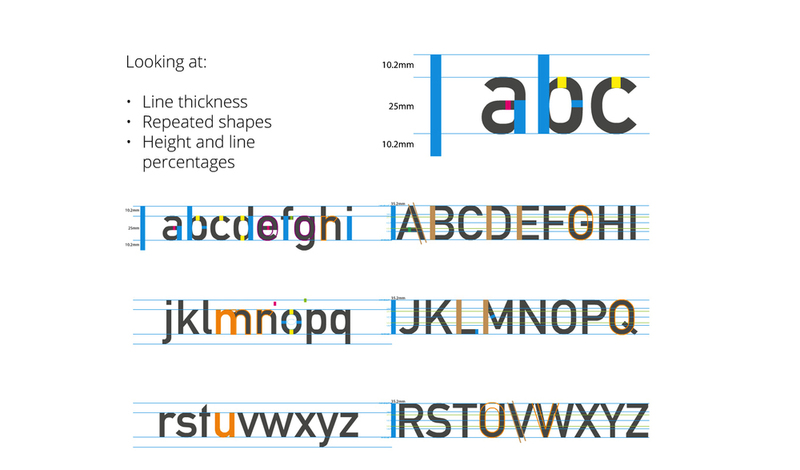 Each little change in axis, line thickness, serif, or terminal can completely change the personality of a typeface. The same with typography, the rules may be more complex and less understood by those that aren’t into type, but it too can be altered or tweaked to change the personality of a page or an article. Ideally one day I would like to go it on my own but I realize that there is so much more for me to learn by doing my time and experiencing the different techniques and styles of others. It’s undeniable that I would love to work in a foundry but there are also other areas of design that have similar challenges that I like. Packaging, branding, publication and, as I have recently discovered, letterpress offer exciting challenges that I am also attracted to. The most important thing is that no matter where I end up, it is a supportive learning environment. If we don’t continue to learn then we will end up blindly making the same mistakes we always have. I am super excited to see how Literae develops and the next steps for Nathan. I feel confident he will see a lot of success and wish him the best of luck with his career as he emerges from his studies later this year. Nathan began by Researching an publishing a report ‘Analysing the Dyslexia Friendly Typeface’ exploring existing dyslexic fonts (and industry guidelines) to identify the design characteristics with the potential to improve literacy for dyslexics. Examples of Rivers, Swirls and Washout. (Frensch, 2003) Shows some of the visual difficulties sufferers of Dyslexia experience while reading. Visual research interrogates existing typefaces construction, shape grammar and visual characteristics. Using two new theories (top half legibility and the thinking behind highly legible motorway signage) Nathan develops a typeface that improves legibility for sufferers of dyslexia. Here he examines the upper lettershapes of existing fonts. and develops a grid to construct the typeface. The construction grid is then consistently applied to the sketches to create a uniformed system. Comparison within a system(as Walter tracey said; 'Great type design is not a collection of beautiful letters but rather a beautiful collection of letters'). Each single glyph must work within the whole system. And made the optical adjustments needed to ensure the top half of letters were preforming at their best! The optically corrected letter were then applied into the system to check for visual cohesion. As a system Nathan assesses for opportunities to improve and correct. to ensure each is distinguishable from one another. The system is named during the construction process... Literae comes to life! 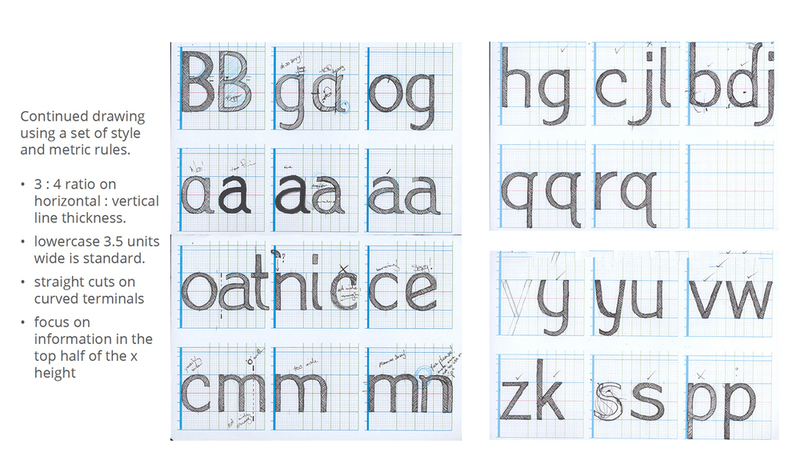 Meet Literae regular the highly legible .ttf outcome of Nathan’s research and design process! Each Literae charecter is easily distinguished by the eye as it bounces along the top half of the letter searching for wordshape recognition. Sample text of Literae, Nathan'sWork-In-Progress Graduation Project.